As every year, the private events organizers add their events inside our web sites. Dates are: 4th-5th Feb. and 11st – 21st Feb. 2012. From 4th to 21st February 2012, a rich program of shows, musical concerti, recital and diffused representations in historic palaces, fields, lanes as well as in the theatres. The 2012 edition of the Carnival has been presented during a press conference, that took place in the regional seat of Rai Veneto, Palazzo Labia. 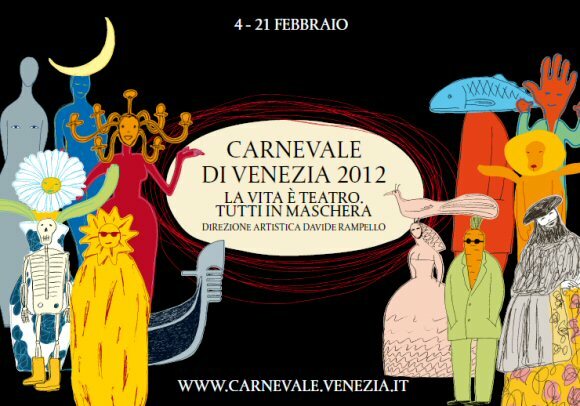 It’s the theatre the big protagonist of 2012 edition of the Venice Carnival “Life is theatre! It’s time to get masked” scheduled from 4th to 21st February. As suggested by the title, dramatization of life with Venice as the capital of theatre. The Carnival in Venice, from the XVI century to the end of the Venetian Republic, coincided with the peak of the theatre season, with many performances not only in the theatres but also in some squares. This years the attention is focused into the valorization of the city, opening many places connected to the history of the Venetian show business, through a rich program of shows, music concerts, recitals and performances in historic palaces, fields, lanes, as well as in the theatres. The main stage will be in Piazza San Marco, where the “Gran Teatro” (Greaty Theatre) will be set up: a spectacular scenic structure that reproduces the big theatrical machines of the past, and that will be the set of some of the main event of the event like The Flight od the Angel, the Parade of the Marias and the Parade for the best masked costume contest. For the art director, Davide Rampello “The Carnival is a big opportunity to involve all the cultural institutions of the city. We are convinced the quality of the shows is basic to cut in the public. We want to create an event where everyone, from the tourist to the Venetian, should express his own creativity and become the protagonist of the event, not just living it as a spectator” . Reconfirmed in 2012 the successful format of last year, with a prologue during the week-end of 4th and 5th February 2012: on Saturday the Grand Toast at the Wine Fountain and on Sunday the Festa Veneziana. “The last two editions of the Carnival were defined by quantity of participation and quality of the event, and even by a lucky meterological situation – says Piero Rosa Salva President of Venezia Marketing & Eventi – and that’s the model we compare with. The introductive week-end, a novelty of last year, resulted a positive and far-seeing choice also in terms of promotion of the two following week-ends. I’m sure that also this year the event will have a relapse on the induced touristic consumption of the city and of the territory”. A kermesse not for tourists only, but rich of events customized for the Venetians. A format appreciated by Roberto Panciera, Coubcillor for Tourism of the Municipally of Venice: “The theme of 2012 edition makes me think hat also this edition of the Carnival will be appreciated by the city. And I hope that the residents will live this event with the traditions and the costumes, and feeling it like their own heritage. We will be in the public eye, and we will have to work at offering a big performance”. Satisfaction for the main cultural format of the event has been expressed byTiziana Agostini, Councillor of Cultural Activity of the Municipally of Venice: “The Carnival has a specific role also from a historical point of view, and it is a big cultural machine, with the mask as a protagonist in a period considered as a big feast”. Recovering the old tradition of the Allegory of the Carnival, a floating bull will be installed in the basin of San Marco and burned at the end of the event, closed, like last year, by the Silent Water Parade.